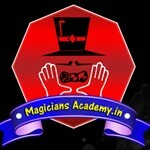 Magicians Academy.in is a registered institution located in Hyderabad, Telangana, India. It is created for the welfare of magicians, especially with a focus to help the struggling magicians by supporting them in various aspects. It serves as the springboard for the upcoming magicians. It strives to provide Scholarships and other benefits from the Government and provide with lot of inputs by way of organizing Lectures, Seminars, and Conferences with the involvement of famous and noted magicians across the Globe.Academy aims at bringing in professionalism amongst the magicians and conduct soft skills and public relations training sessions for the magicians. Provides a platform exclusively for the magicians to share their thoughts & experiences, train to gain and transfer knowledge to elicit new ideas and also research on enhancing ideas all under one roof in the world of magic.